back in print, and The Justice Society of America had been reincarnated as The Justice League. A new Hawkman was in the tryout stages. It was handsome young scientist Ray Palmer (who, by the way, was named after a famous science fiction editor of the 1950s) who acquired that power in Showcase #34 (Sept-Oct 1961). He's gotten hold of a piece of a dwarf star, and experimenting with it at Ivy University facilities (he was a professor there) enabled him to use it to control his size and weight. Within a year, he was holding down a comic of his own, and had become a member of The Justice League of America. The writer was Gardner Fox (Doctor Fate, The Sandman), and the artist was Gil Kane (Iron Fist, Blackmark). The Ray Palmer character did have a predecessor, of sorts, at DC, even tho the 1940s Atom wasn't it. The 86th issue of House of Mystery (Apr-May 1959), one of their science fiction/fantasy titles, ran a story titled "The Atom Detective", in which private eye Vic Randall is reduced to six-inch size, and busts up a crime ring in that form. Some of his "atom-size" schticks, such as launching himself through a window by grabbing hold of a shade cord, were adopted by The Atom. The story was drawn by Bill Ely (Rip Hunter, Time Master), but the writer's identity is unknown. Was this an early trial for the concept? Did writer Gardner Fox lift the idea from this story? Or is the confluence of name and motif simply a coincidence? 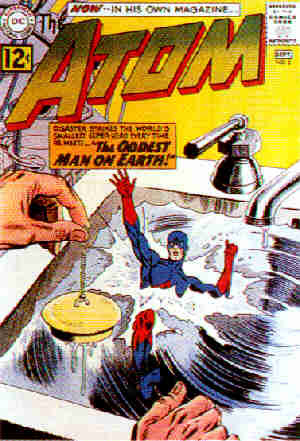 Like his super-small contemporary, Marvel's Ant Man, The Atom never did reach the heights of popularity. His series rode the crest of the 1960s superhero wave, but when the boom faded, so did he. Starting in 1968, he had to share his comic with Hawkman, who was also starting to wear out his welcome with the fans; and in 1969, the comic was cancelled. Since then, he's had an occasional mini-series, an occasional slot in the back pages of an anthology comic, an occasional special — they've even regressed him in age and stuck him in a latter-day incarnation of The Teen Titans — he got better, and is now retired, after appointing a successor, Ryan Choi, also an Ivy University professor, to carry on the Atom tradition.